Okay, maybe you can’t tell from the picture, but this was a cold day. I mean a middle-of-January can’t-feel- your-toes kind of cold. Wind chill probably in the 20s. 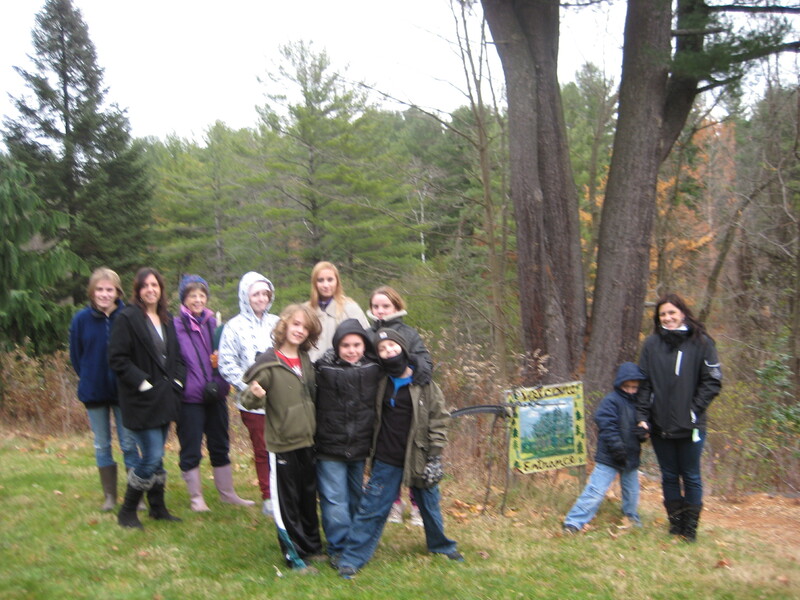 And this hardy class from the Bethlehem Children’s School in Delmar NY braved the weather to explore the Pine Hollow Arboretum. Pine Hollow is the ultimate unmowed backyard. It’s the product of decades of work by Dr. John Abbuhl, who turned his suburban Slingerlands home into a living museum. More than 3,000 plantings of trees, shrubs, and vines. Twelve ponds. Trails, paths, valleys and hills. It’s amazing what you can do with a backyard and a vision. Anyway, the students and I moved briskly along the Pine Hollow trails to keep our noses from freezing solid. We were studying wildlife adaptations to winter, and the Arboretum is a good place for wildlife. An oasis of green (even though a cold oasis) in the suburban desert of parking lots, roads, malls, and lawns. We found skunk trails and deer tracks, woodpecker signs and insect galls. 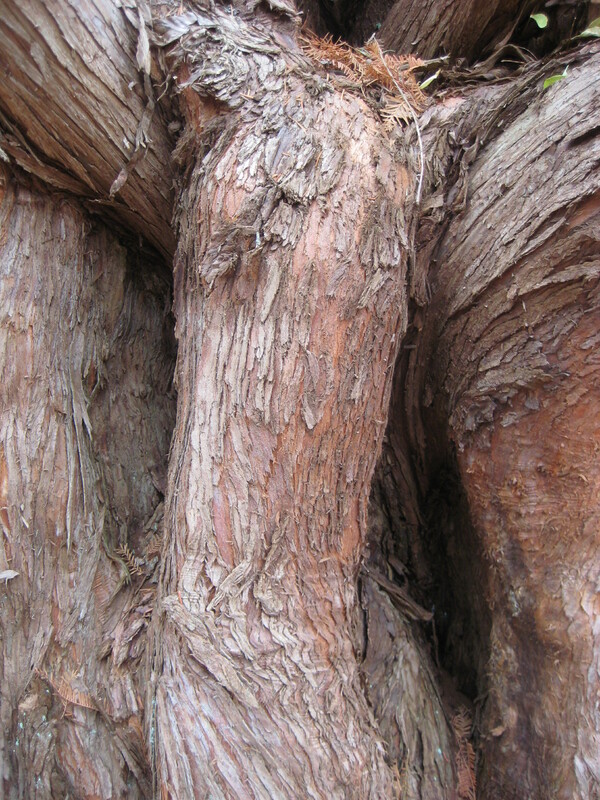 This remarkable tree with the elephant-like trunk is a Metasequoia glyptostroboides, or Dawn Redwood. Instead of an elephant, perhaps it would be more accurate to compare it to a dinosaur. 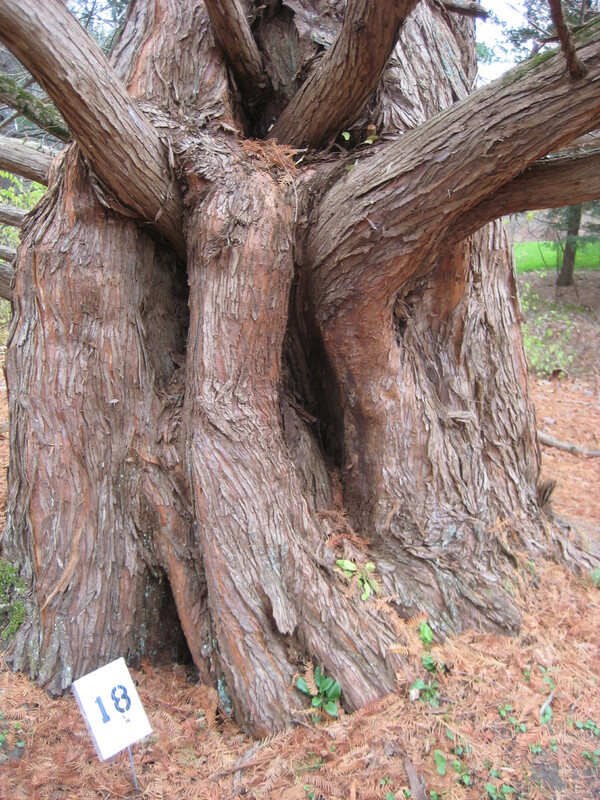 Because for many years scientists believed that all Metasequoias were extinct. 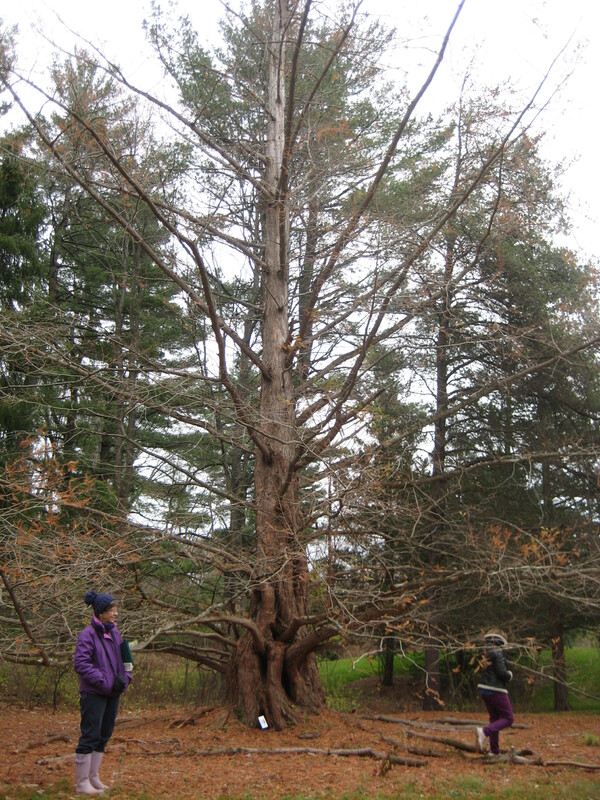 This was once one of the most widespread tree species in the Northern Hemisphere. In the Cretaceous Period, millions of years ago, Tyrannosaurus rex and Triceratops rambled around under the branches of towering Metasequoias. But then the Metasequoias went the way of the dinosars–scientists thought. Traces of the lacy foliage were found as fossils in the early 1940s, but there didn’t seem to be any living Metasequoias left anywhere on the planet. Then, in 1948, an intrepid botanist (is there any other kind?) led an expedition thousands of miles, up the Yangtze River, and over mountain ranges, and in a misty Chinese valley he discovered a tiny remnant of a forest of giant living fossils. Turns out the Metasequoias weren’t extinct after all. There aren’t many of these elephant-trees left in the wild, and they’re considered critically endangered. But seeds were distributed to Arboreta around the world. Places like Pine Hollow keep Metasequoias flourishing. 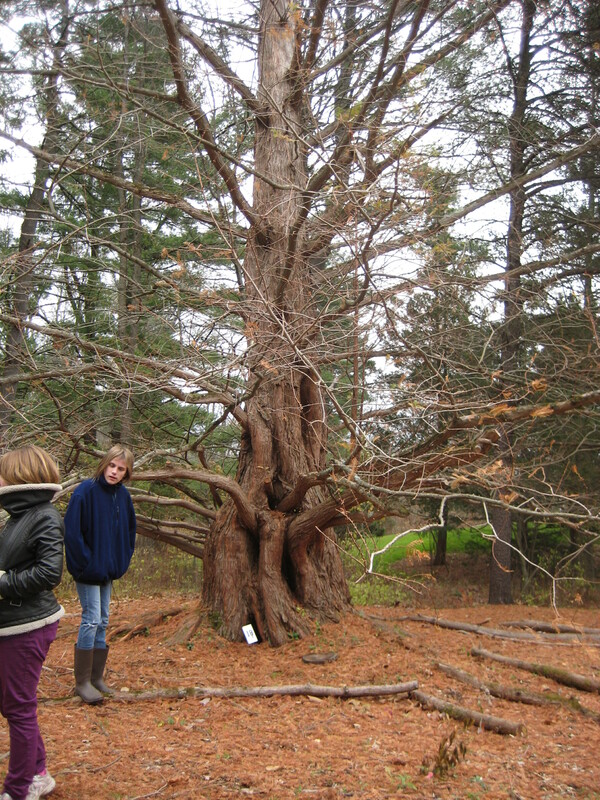 The Bethlehem Children’s School upper-grade students will be visiting the Arboretum and the Metasequoia once a month through the school year to observe and document the changes that occur through the seasons. Thank you for paying for us to come. It was great to see you there, Latonya! The Arboretum has a grant to pay for the schoolbus for the trip, which is pretty cool! What a beautiful day it was.